Goldilocks wasn’t the only one searching for something that’s “just right.” When looking for a place to live, many Americans want a location that isn’t too big or too small. If urban centers such as New York and Los Angeles are overwhelming and rural towns are too sleepy, there are many small cities across the U.S. that could be the perfect fit. NerdWallet crunched the numbers to find the best small cities in America — places that hit the mark in three key areas: economic health, affordability and quality of life. To do this, we looked at over 1,300 cities with less than 75,000 residents and used data from the U.S. Census Bureau’s American Community Survey. Midwest is best. The low cost of living, reasonable commutes and economies boosted by jobs in health care, education and technology manufacturing helped cities in the Midwest perform well. College towns rule. Many cities in the top 10 are home to at least one college or university. Others have a mix of public, private and technical schools. These institutions are a draw for residents and employers. Moorhead residents get the perks of a small city — affordable housing and a good work-life balance, for example — plus the added economic boost from Fargo, North Dakota, its big neighbor across the river. The city’s unemployment rate in February was about 3%, which is below the national average of 5.5%. Workers aren’t plagued by long hours or long commutes, giving them time for their families and communities. If the scenery in Winona doesn’t win you over, the short workweeks and low cost of living might. Set amid the bluffs along the mighty Mississippi River, Winona’s median rent was nearly half of the average median rent of cities in this study. And with an average workweek of just 32.5 hours, residents have time to enjoy all the city has to offer, including the annual Dixieland Jazz Festival and Winona Steamboat Days, a weeklong festival that includes a car show, parade and fireworks display. With a population of about 29,000 people, Marion might be small, but its art scene is big. The city is home to the Marion Philharmonic Orchestra, a community arts school that offers dance, cooking and acting classes. The area also has multiple performing arts venues, including the Marion Civic Theatre, a staple in the community for over six decades. Most residents can afford to enjoy the entertainment options thanks to the city’s low cost of living. The median home value in Marion is $64,000, and the median monthly homeowner cost, which includes payments for a mortgage, insurance, taxes and utilities, is $744, which is lower than any other city in this study. A diverse job market that includes health care, education and manufacturing has helped keep residents employed and wages strong in Cedar Falls. Residents have short commutes, about 13 minutes on average, and a good work-life balance. Workers log an average of 33.2 hours weekly, leaving ample opportunities to enjoy the Cedar Valley region’s 94 parks, 13 museums and 10 performing arts venues. The third in the trio of Minnesota cities to land in the top five, Mankato packs a lot into its 17.91 square miles. Galleries, sculpture displays and theaters populate this regional art and culture hub, and miles of biking and hiking paths stretch far beyond the city limits. Mankato isn’t all play, though. The city’s jobless rate has consistently been lower than the national average, thanks in part to major employers such as the Mayo Clinic Health System and Minnesota State University’s Mankato campus. A low cost of living and strong job market are just two factors that help Wooster shine. Median rent in Wooster falls well below the average median for the cities we analyzed. Higher education institutions, such as the College of Wooster and Ohio State University’s Agricultural Technical Institute, keep this city of about 26,300 people buzzing with young, ambitious residents. Neighborhood gardens, free art exhibits and a vibrant downtown give Stevens Point a strong community vibe and contribute to the high quality of life. Almost 13% of the city’s residents walk to work, and the average commute time is about 15 minutes. With an average workweek of 33.4 hours, those living in this small riverfront city have time to enjoy the simple things in life, like a beer at one of the area’s many breweries or a bike ride along the Green Circle Trail. Marquette is one of the snowiest cities in America, averaging almost 15 feet of the white stuff annually, but that doesn’t stop residents from hoofing it. Here, about 16% of residents walk to work, and the average commute time for all workers is just shy of 11 minutes. When the snow melts, Marquette’s 21,500 residents can explore the beaches, parks and waterfalls in and around the city. Terre Haute is the largest city in the top 10, and it’s also one of the most affordable. The median home value hovers around $77,200, compared with an average median value of $221,817 for the cities in this study. And the median monthly homeowner cost in Terre Haute of $823 was well below the overall average of $1,677. Two universities — Indiana State University and Rose-Hulman Institute of Technology — call Terre Haute home and help contribute to the city’s level of employment. The capital of Big Sky Country, Helena offers a host of recreational activities and natural beauty for residents and visitors alike. The city boasts high employment coupled with an average workweek of 37 hours and a commute time of 13.4 minutes. The largest employer is the state government, giving the city a stable economic foundation. Affordability. To determine a city’s affordability, we looked at the median value of owner-occupied units, the median rent price and the median monthly homeowner’s cost. This category was one-third of a city’s final score; each subcategory was given equal weight. Economic health. To determine a city’s economic health, we looked at the percentage of residents who are unemployed, median household income and percent of families and people whose income is below the poverty line. This category was one-third of a city’s final score; each subcategory was given equal weight. This study doesn’t include cities where the percentage of residents living below the poverty line was 30% or higher. Correction: An earlier version of this article mischaracterized unemployment data in a few cities. The data have been corrected. 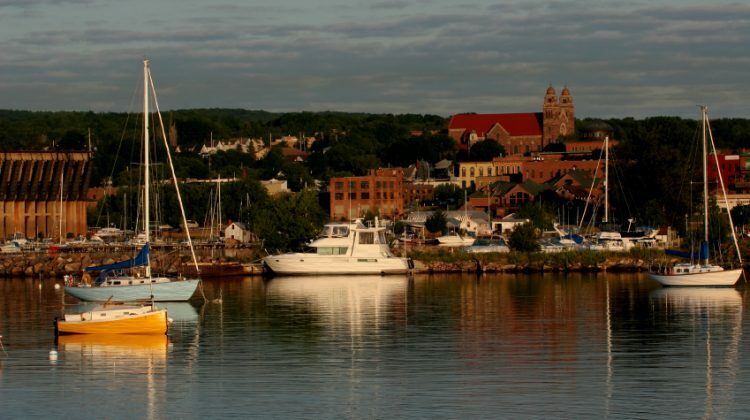 Marquette Harbor, Michigan, image via iStock.